Hamilton Academical plan to launch a legal action against RBS after the club was defrauded of almost £1m. The Scottish Premiership team was targeted in a sophisticated scam last October which wiped out its savings. And now its board have instructed lawyers to write to the bank in a bid to recoup half of its losses. But RBS said it was confident there was no breakdown in its security procedures and the bank is working with Police Scotland to identify the culprits. 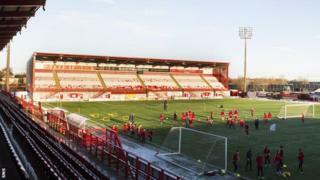 Hamilton chief executive Colin McGowan confirmed the club managed to recover about £170,000 after the vishing fraud. But the rest, about £800,000, remains outstanding. Mr McGowan said: "We believe the bank have to look at their duty of care and their security. "We are not claiming to be blameless but we have been the victims of a complex fraud and I don't think it would have taken place if things had been different. "As far as I am concerned there is proof positive that there was security lapses at the bank. "It does not take Sherlock Holmes to work this out." Vishing, which is also known as social engineering, usually takes the form of a call from an individual purporting to be from the bank. The target is then told funds have to be moved urgently. Armed with sensitive information, the fraudster can then use the data to override telephone or online banking security. On 9 and 10 October last year phone scammers convinced a Hamilton employee - who was the sole authorised user of the club's Bankline accounts - to move money into 26 accounts to prevent theft. The club said the first two payments - of £40,000 and £70,000 - were initially suspended by RBS's cyber security team. But the club employee was convinced by the scammers to ignore the warnings and continue the transactions. The following day £655,000 went out in 20 transactions. RBS confirmed it has yet to receive a formal response from the club's lawyers. A spokeswoman said: "The bank is confident that there has been no breakdown in our security procedures in regards to this scam and that no unauthorised persons were able to gain access to any of the club's banking facilities. "All payments were keyed and approved by the authorised user of the club's account. "The bank contacted HAFC to question the transactions on two separate occasions and the customer instructed the bank to continue with the payments. "RBS is working with Hamilton Academical Football Club and supporting Police Scotland to identify the perpetrators of this scam. " After news of the Hamilton fraud broke it emerged that Heart of Midlothian had also been the subject of a similar fraud.